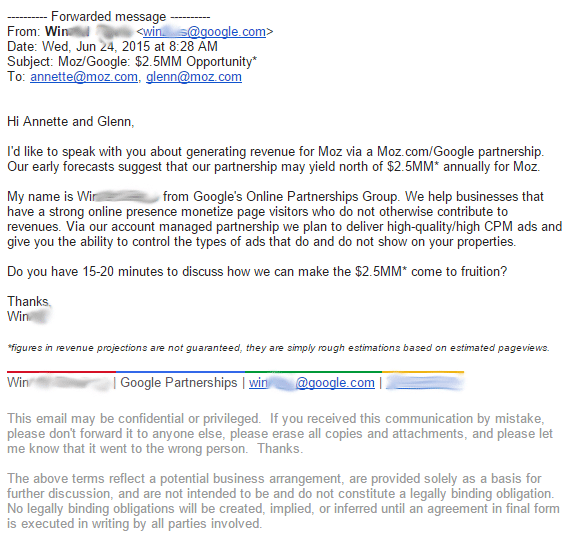 Rand Fishkin, the co-founder of Moz, posted a picture on Twitter of an email they received from Google about how Google can monetize their site and help them earn $2.5 million through Google ads. The email talks about the Google's Online Partnership Group and how that group works with web sites that have a "strong online presence." The group can help Moz monetize the page views through "high quality/ high CPM ads and revenues." They even go as far to say that their estimates say Moz can earn $2.5MM annually from the partnership. Of course, Moz is not interested in $2.5M, they are interested in growing their subscriber base for their monthly subscription fees. Ads may distract from that.